Thank you for all your well wishes, Ebi-kun is taking it all in his stride and declared that he was going to learn to draw and write with his left hand like Leonardo da Vinci! We went back to the hospital, they changed the dressing, what he has is a half cast supporting the under side of the arm. So, first they put on one of those blue cool patches, I assume to reduce swelling, then put his arm in the hard half cast and then bandaged it up with an elasticated bandage. I have to change the cool sheet twice a day, this seems like a lot of man-handling to me, but I am not doctor. 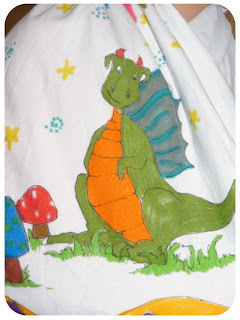 He was a happy chappy when he saw it even though my version of a dragon is rather cute and not a scary one! 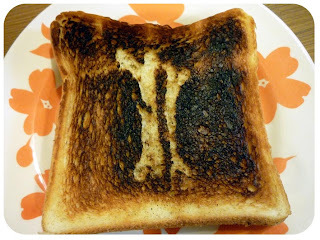 Then yesterday I managed to burn the toast (definitely one of those weeks), instead of seeing it as a piece of burnt toast, I saw.... X-ray toast, Ebi-kun declared that I am a little bit crazy, maybe he is right :o) Didn't stop him eating it. 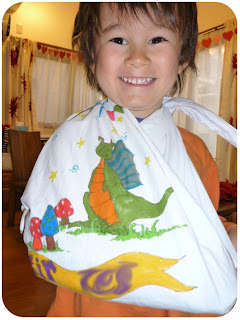 That sling is so cute! He looks so proud of himself I hope you don't have trouble getting him out of it when it's no longer needed! I love your Vday decorations in the background, too! You are truly an original artist - X-ray toast, LOL!